“How can you generate reliable income from your retirement savings that lasts for the rest of your life, no matter how long you live and no matter what happens in the economy? With the decline of traditional defined benefit pension plans, addressing these questions is one of the most important retirement planning challenges facing boomers today. Many surveys show that older workers and retirees are struggling with these questions and need help. Money for Life provides this help by describing in simple terms the three methods for generating a “retirement paycheck” from retirement savings. It explains the pros and cons of these methods, as well as their many varieties and permutations, to help soon-to-be retirees understand just how to generate the money they need. A critical factor is the amount of the retirement paycheck, which can vary widely depending on the method chosen to generate retirement income. This understanding will remove the mystery and frustration around this critical retirement planning decision. Money for Life addresses the concerns of a wide range of people who are planning their retirement. Part One outlines specific action steps and describes the various retirement income generators in an easy-to-understand manner, using charts, illustrations, and examples. It also introduces the Money for LIFE™ retirement income rating system to help you choose the solution that works best for you. Part Two serves as a resource for readers who want more details on the methods for generating a retirement income and on specific retirement tax and insurance issues. It’s OK to spend many hours doing your homework before making retirement planning decisions. These are the most important financial decisions you’ll make for the rest of your life. Don’t spend without planning, which is what many people do, and is a sure way to go broke in retirement. Instead, plan your spending, so you’ll have income for the rest of your life. Be careful when selecting a financial advisor to help you generate retirement income. Many planners don’t have the necessary expertise or your best interests at heart. Money for Life provides critical help for boomers who are approaching their retirement years as well as their financial advisors, and for employers and retirement plan sponsors who want to help their employees and participants better prepare for retirement. Here’s the cover, Table of Contents and the Introduction of Money for Life. Click to view PDF. Contact us for bulk sales or if you would like to have Steve deliver a presentation on Money for Life to your employees or members. Possibilities include in-person, webinar, teleseminar, or online tutorial. When can I retire? How much do I need? How do I make it last for my lifetime . . . 20 years, 30 years or more? “As defined contribution plans and IRAs become an increasingly important part of retirement wealth in this country, it is essential that today’s workers understand the various techniques available to convert the account balances to retirement income. Steve Vernon has done a magnificent job of drawing together in one authoritative source the benefits and potential limitations of the various strategies that should be considered by individuals. “How will you pay your bills in retirement—especially if you live a long, healthy life? 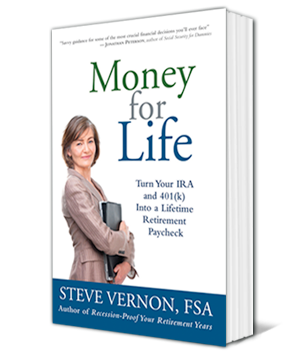 Steve Vernon’s amazing Money For Life provides the answers you need. “Money for Life is for retirees and pre-retirees who have a real danger of running out of money in retirement. Steve’s approach addresses the insufficiency of using only a systematic withdrawal method for people with average retirement savings, where managing for retirement specific risks must take precedence over investing strategy. Thank you for providing this actionable approach to help people make informed retirement income decisions! This is a great book. As an actuary, I have been very concerned that many people do not understand the importance of regular lifetime income, the risk of running out of money, and the options for creating lifetime income. The decision involves trade-offs, long term issues, and working with a range of solutions that are not easy for the average person to understand or implement. Steve Vernon has done a wonderful job of explaining the options, providing information on implementation, and cautioning about more expensive options.